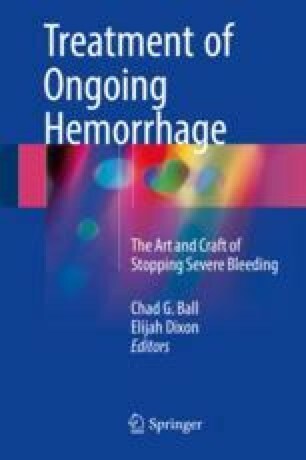 Major bleeding from the lung presents several unique diagnostic, physiologic, anesthetic, anatomic, and technical challenges for all surgeons alike. Patients requiring emergency lung surgery are often in dire physiologic distress; hemoptysis is often present; patient positioning may be suboptimal; the incisions, instruments, and intrathoracic anatomy may be unfamiliar; exposure is limited by a large inflated lung; and bleeding can be brisk. Thankfully most lung injuries require simple technical solutions. The employment of damage control principles with generous thoracotomy incisions, early calls for help, and pressure control can often stem the tide. Peripheral injuries require rapid stapled wedge excision. Central injuries are often fatal, require rapid mobilization and cross-clamping of the lung, and require pneumonectomy or careful suture placement when possible. When in doubt, if control is achieved with packing, it’s reasonable to pack and return later for second-look assessment.